Water falls, geysers, fresh spring water out of the tap, warm water in the showers heated from geothermal activity, blue lagoon, and the Atlantic ocean. Water was a big part of our stay. The first thing we noticed was the tap water is really great. I understand they don’t process the water here at all, they just pump it right out of ground pure and clean! Also, the shower water has a faint smell of sulfur. They pump the hot water right out of the ground near the volcanoes! We spend huge amounts of energy cleaning and heating water in California, and these guys just stick a pipe in the ground and they are good to go. 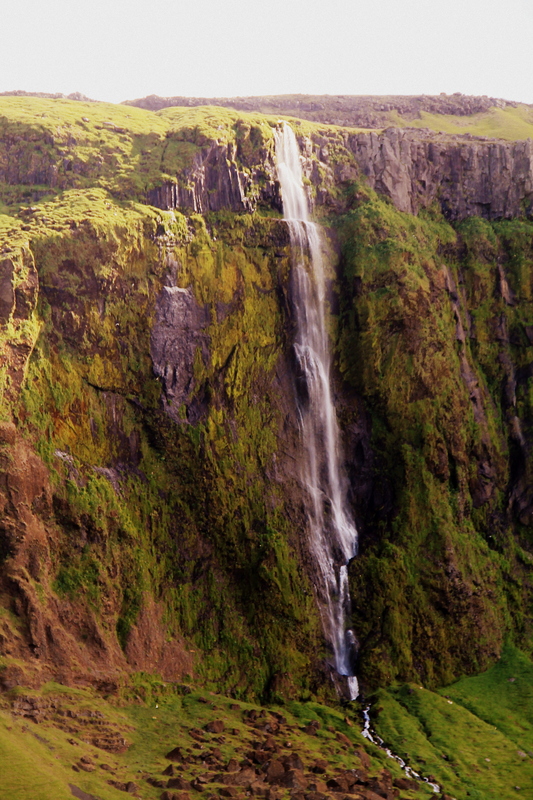 We saw waterfalls everywhere we went in Iceland. The whale watching seemed pretty much automatic, unlike the whale watching in California where it is not unusual to spend all day looking and not spot a whale. The water just off the coast of Reykjavik seemed to teem with Minke whales the day we went out. 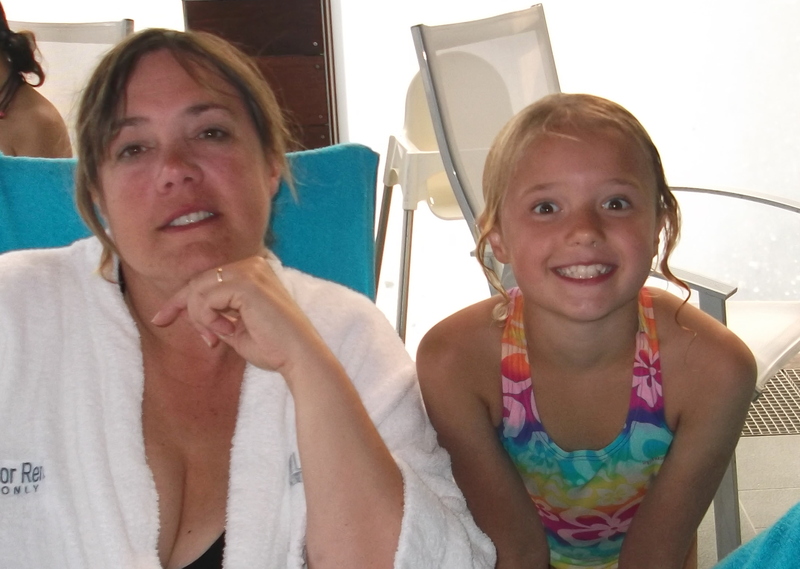 The kids loved riding on the bow of the boat; Suzanne – not so much. She spent the final 2 hours of the boat ride laying down in the most stable part of the ship with a bag handy. Check out Alex’s excellent write-up on the whales & puffins. The fishing also seemed automatic. We jigged off the side of the boat for cod, and then grilled up fresh fish for dinner on the boat ride home. Patrick and I exchanged stories with a few folks we met from the Washington state and Virginia. However, while we were gabbing the fish were served and a group of German fishermen (who were drinking beer and a bottle of orange something or other) ate all the fish! The crew had to toss on a couple more cod for us Americans. See Patrick’s terse but impactful post on the fishing. Gullfoss waterfall is a spectacle. It is extremely dramatic and makes for great photos. I”m working on a fictional story using events and places from our travels and I plan to have Patrick’s character repel down rope to the rock island in the middle of these falls. I asked Patrick if he thought he could make it out there, and he said “no problem Dad, just get me the right equipment”. That’s my boy! At the Geysers we were standing a little too close to the geyser when it went off and ended up taking an inadvertent geyser shower – soaked to the skin in warm sulfur water. I pulled out my trusty bandana (thanks Jennifer) and quickly got the camera dried out. 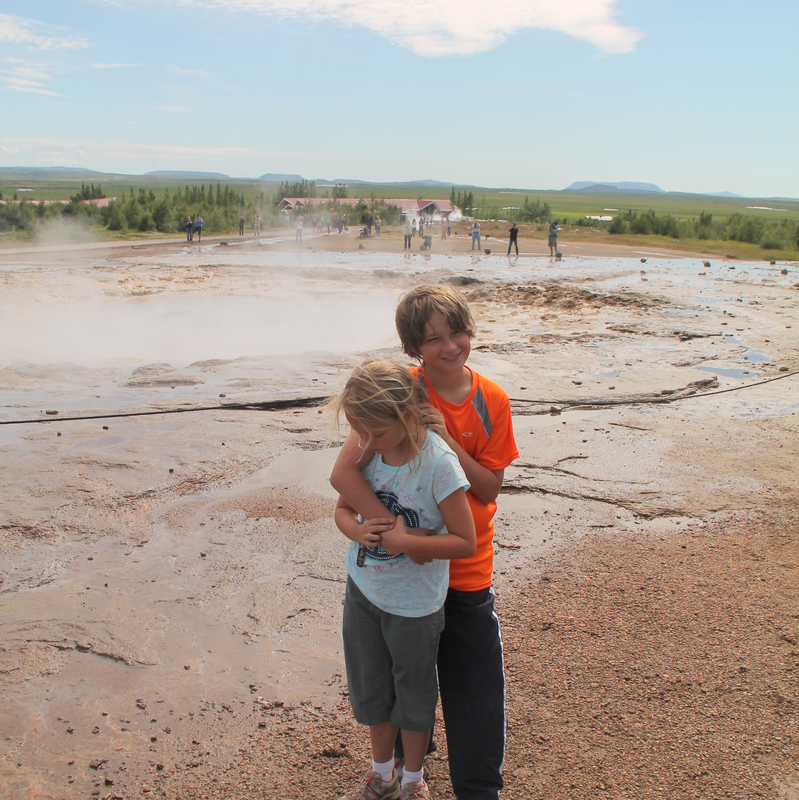 It was tons of fun and the kids wanted to stay and play chicken with the geyser all afternoon. Suzanne and I had enough of this type of fun and pushed us onward. The Blue Lagoon was truly an indulgence. We were all tired from the long days in the car, and Suzanne was a little “off” owing to the bite of shark she had in the morning. We soaked in the warm blue water until we pruned up. One of the active ingredients in the blue water is white slimy muck that they put in buckets and convince patrons to smear on their faces and let it harden. Turns out they sell this stuff for a pretty penny at the gift shop and on-line. Patrick and I tried the saunas. The place is a big draw for tourists since it is only about 20 minutes from the airport. However, it is a big facility and we didn’t have any problems. 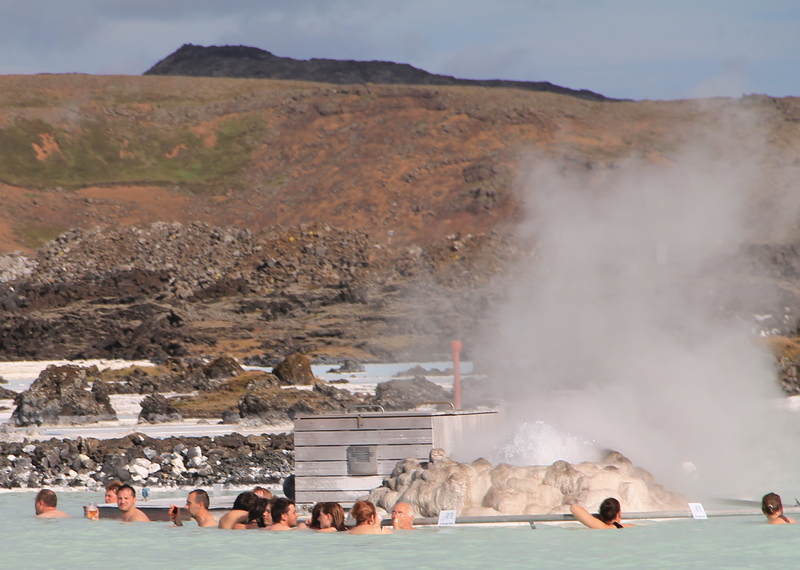 If you ever have a long layover at the International airport Keflavik, the Blue Lagoon is a great place to relax before making the connecting flight. Really great pictures Les. I am reading your blog regularly and thanks for taking me to a place (via wonderful pictures and narration) which I may never visit! Those puffin birds are really very cute. My pleasure, I’m glad you are enjoying it. photography class this past Saturday, and learn how to take better pictures;-) I practiced on Sunday, and will practice each week until I leave. Keep us writing and posted in your blog! My “tricks” for getting good pictures are (1) get a good camera and learn to turn the little dial on the top at the right times (2) Get a big disc card for your camera and take lots of pictures in hopes of getting one good one (3) Go to places where there are lots of great things to photograph. I’m looking forward to seeing some great pictures from your travels in Africa.